Large parts of the first week I plan to visit Assynt, where I hope to go hillwalking including Ben More Assynt and Conival. I'll probably also walk to Eas a' Chùal Aluinn, the highest waterfall in Britain. Further suggestions by anyone who knows the area are welcome. For most of the time I'll be based in the Inchnadamph Hotel (notable trivia: Idlewild wrote their 'The Remote Part' album in Inchnadamph). Travelling south I might visit Kintail, haven't decided that yet. The last night on the mainland will be spent at the Empire Travel Lodge in Lochgilphead, which has an interesting history. Then it's on to the ferry over to Islay. Most of the second week will be spent on Islay, weather permitting I'll take the ferry to Jura to tackle at least one of the Paps of Jura. 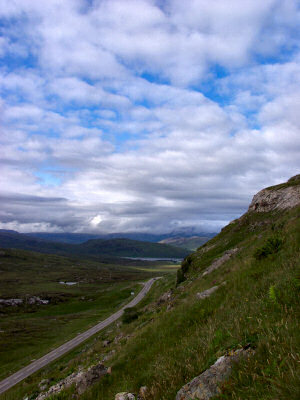 Apart from that I'm planning to do some other walks, visit Kilchoman Distillery (among others) and just relax. Before returning to Swindon I hope to fit in a walk in the Arrochar Alps, where I'll be staying at the Village Inn in Arrochar. I think that's about it. Sounds good, doesn't it?